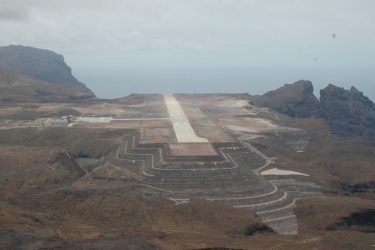 Built at 1000ft above sea level, with the relentless South Atlantic Ocean abutting three sides of the airfield, the engineering marvel that is St Helena Airport has been constructed on St Helena, a British Overseas Territory in the middle of South Atlantic Ocean made famous by the incarceration and death of the infamous Napoleon Bonaparte. The island is (almost) in the middle of the South Atlantic Ocean, 1200 miles west of Africa and 1800 miles east of South America; it’s nearest alternate airfield (Ascension Island) is 700 miles north and if you were to travel due south from St Helena, the next landmass you’d meet is Antarctica. The island is literally in the middle of nowhere and previously only accessible once every three weeks by sea. Yet despite its remote location and the huge logistical challenges that faced the contractor (Basil Read), the airport was built from scratch in just 4½ years. And it did not just involve the construction of the airport; the project also called for additional infrastructure to be built in support of the airport as well as its construction. This included a new jetty to land construction equipment, vehicles and materials, all of which had been transported by sea from South Africa and Namibia. 14km of new road then needed to be constructed to get the construction vehicles and materials to the airport construction site. Temporary accommodation needed to be constructed to provide for the influx of workers. During the project a new Wharf was built to the north of the Island to permit a more efficient cargo operation, a new Sea Rescue Sub-Centre was formed and a new Sea Rescue Building (with new boats) was provided; an Airport Fuel Facility and a new Bulk Fuel Facility were also built to accommodate the Island’s current and future needs for air and ground fuels. The airport itself consists of a single concrete runway just under 2km long, a modern two-storey Terminal Building and a “Combined Building” accommodating ATC, MET, ARFFS, and other services. An off-site Fire Training Rig has been built to support the ARFFS in providing fire coverage up to Cat 7; as such the airport can accommodate aircraft such as Boeing 757-200, 737-800 and Airbus A319. It has hosted many private flights and makes an ideal stepping stone between Africa and South America for corporate jets. Construction and earthworks at the airport site itself began in October 2012; a large portion of the initial construction activity involved filling a valley with 7.6m m3 of local rock to provide a suitable paved area and Runway End Safety Area; this work alone took 22 months to complete, building up a series of terraces totalling 120m high and involving 450,000 journeys by articulated dump trucks to bring and move aggregate around the site. Other parts of the airfield site had to be levelled to ensure the runway could be built and the airport could operate safely. Remote Obstacle Lights needed to be broken down into manageable parts and physically carried by hand along sometimes treacherous landscapes to then be reassembled and strategically installed. Navigation aids such as an offset localiser, DVOR, and NDB were installed. LiDAR (Light Detection and Ranging) equipment has also been installed to detect air motion down the approach path to aid ATC and MET to measure and report on the wind conditions, and to advise pilots of the conditions they will encounter at crucial stages of the final approach and landing. But not only did the airport project need to construct an airport and associated infrastructure to meet international aviation standards, it needed to do so in an environmentally friendly way. 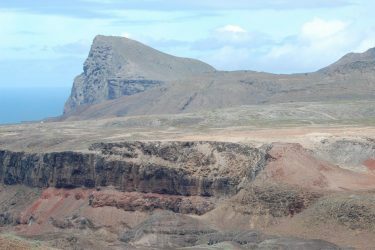 The only place on Island that could accommodate the airport is also the most environmentally sensitive, containing many endemic species, some of whom were only discovered in recent years. One of the endemic species is the St Helenian Wirebird; the population of this small, plover-like bird was in decline by the time the construction project started and it was the role of the project to protect the Wirebird’s habitat and to work to increase its population. As a consequence of this effort, the Wirebird population increased 50% during the project and continues to improve to this day, with a growing number of Wirebirds now resident on the airport itself. Additionally, the project required temporary areas used for construction materials and equipment to be rehabilitated to their pre-construction state (or better). Likewise, where land was permanently ‘lost’ to accommodate the aerodrome such as the runway and building footprints, the equivalent area of land elsewhere on Island was also rehabilitated to retain and enhance the natural environment, and to mitigate against the permanent effects of the airport’s footprint. 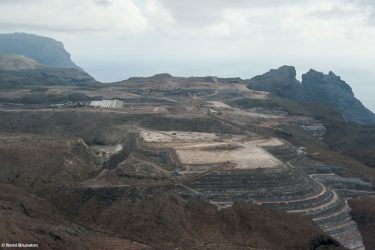 After just over 4 years of intensive work, the Airport was completed in early 2016, and in March of that year the Airport received the first fixed wing jet aircraft ever to land on St Helena. 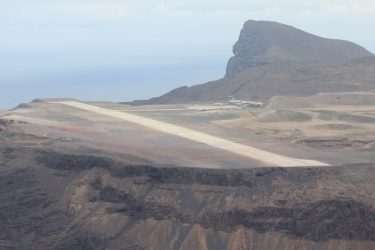 Following extensive audits and certification inspections to international aviation standards, St Helena Airport was granted its aerodrome certificate in May 2016 at its first attempt. This was huge cause for celebration given the sheer size of the engineering and logistical challenges undertaken. Unfortunately issues with windshear only became apparent after completion; consequently this prevented commercial operations commencing in 2016 until further investigative work could be undertaken. But nevertheless the airport received dozens of private aircraft during 2016 and 2017 as word got out about this remote and newly-built airport. 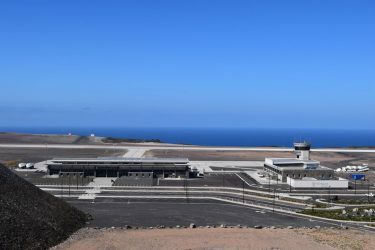 But in late 2017, all of the effort to construct and operate an airport and associated infrastructure culminated in the arrival at St Helena Airport of the first commercial passenger flight on 14th October 2017. This signalled the start of a weekly air service from OR Tambo International Airport in Johannesburg South Africa, via a technical stop in Windhoek Namibia. The service is operated by SA Airlink using Embraer E190 aircraft and carrying up to 85 passengers, thus providing the only means of mass access to the Island. 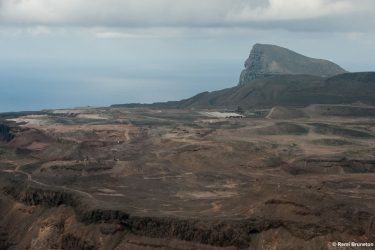 Not only does St Helena Airport provide access to local residents and what is hoped to be a growing number of tourists, it is also a conduit to life-saving treatment; it has already saved the lives of critically ill residents, from new-born babies to older persons, reducing the previous five day journey to the African mainland by sea to just a five hour flight. 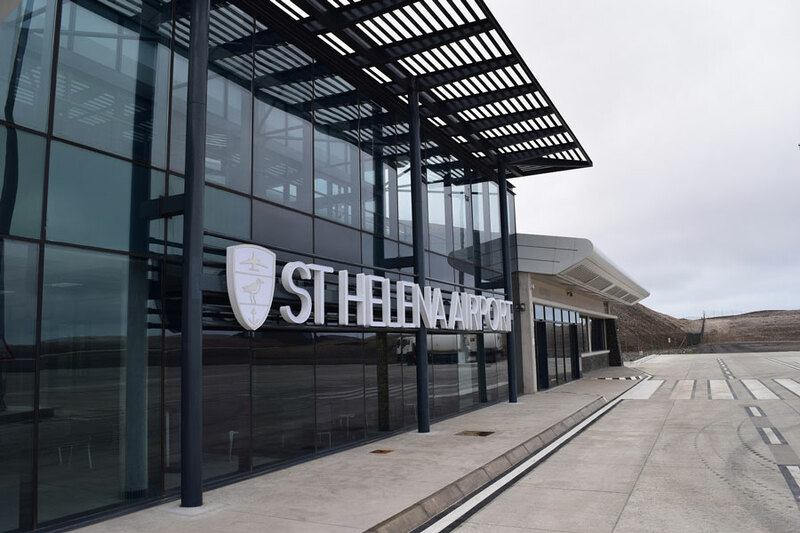 St Helena Airport is not just another airport – it is literally a lifeline and gateway to the rest of the world, and a springboard to a prosperous future for all residents of this tiny island measuring just 47 square miles.